for the latest festival details - music, art, food and more! 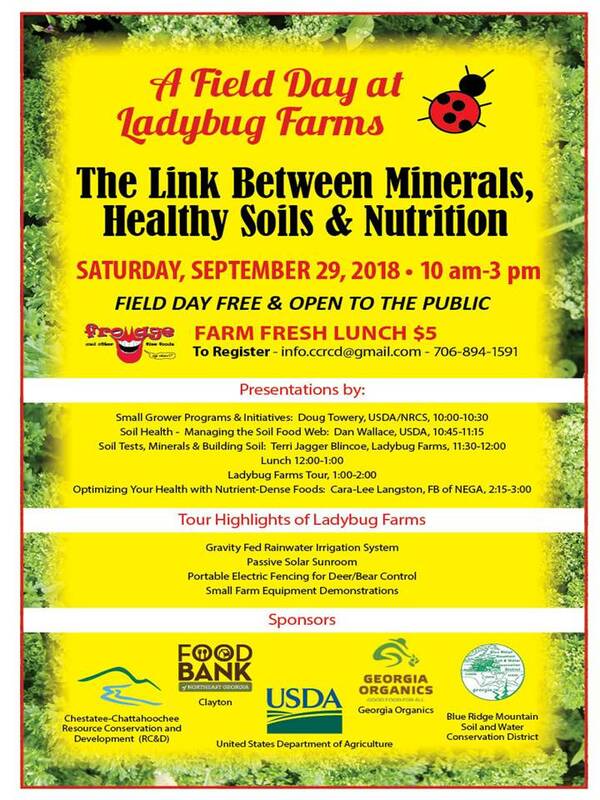 On Saturday, Sept. 29, Ladybug Farms will host a field day on Minerals, Healthy Soils and Nutrition from 10 a.m. to 3 p.m. The field day is designed for Eaters interested in learning more about nutrient dense foods and for Hobby and Market Growers that grow healthy food. Come hear presentations from Doug Towery & Dan Wallace of the USDA, Nutritionist Cara-Lee Langston and Farmer Terri Jagger Blincoe. If you have additional questions or have dietary accommodations, please contact Kim McCollum at 706-894-1591; or info.ccrcd@gmail.com. 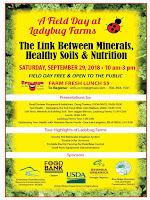 This field day is generously supported by the USDA, the Blue Ridge Mountain Soil and Water Conservation District, Chestatee-Chattahoochee Resource Conservation and Development, the Northeast Georgia Food Bank and Georgia Organics. CSA Clayton 2018 - Celebrating 10 Years! Eat healthy this summer with a weekly basket of farm fresh produce grown right here in Rabun County. Heirloom varieties of beets, carrots, cucumbers, beans, greens, potatoes, tomatoes (of course) and more! Two weekly Clayton pickup options - Mondays from 4:30-6 at the Rabun County Public Library and Thursdays from 10-12 at the Rock House Park. Weekly deliveries begin the last week in May and continue 15 weeks through the first of September. The CSA Program includes 7-9 different seasonal items each week and more than 40 produce items throughout the season. Please email terri@ladybugfarms.net or call 706-782-7244 for more information or to sign up. The Georgia Water Coalition, a statewide coalition of over 200 organizations dedicated to protecting and preserving Georgia's waterways, has named Ladybug Farms as one of their inaugural Clean 13 honorees. The gravity fed rainwater harvesting system in place at Ladybug Farms captures more than 32,000 gallons of rainwater to irrigate crops over a 3/4 acre growing area. Click on the link below to watch the short YouTube video that highlights the work of all the award recipients. https://youtu.be/Qy_QHqzLDsU. An award ceremony honoring all recipients will be held March 8, 2018. Exciting!! Tiny House arrives at Ladybug Farms! Exciting news to share indeed! Ladybug Farms has been awarded a Tiny House that was built by UGA Sustainable Building Design students and funded by Georgia Organics. The Tiny House will be used as housing for folks that attend Adult & Family Farm Camp at Ladybug Farms. For more information about 2-4 Night Tiny House stays at a Working Organic Farm please email farmcamp@ladybugfarms.net. 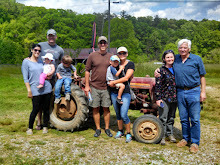 Ladybug Farms recently became the first USDA Certified Organic Hay Supplier in Georgia as part of the Georgia Organics 100 Farms Campaign. The hay is a fescue grass mix which has been amended with white clover and vetch to increase nutritional value. This hay is ideal for feeding to small herds of goats and sheep that are pursuing organic certification. It is also an excellent option for folks seeking a chemical and fertilizer free mulch in their vegetable garden beds as well as for making biodynamic compost.